Blub: Amateur production and lack of breadth irrevocably mar this retro industrial act’s freshman label debut. If you’ve been around the scene for a few years or more, you’ve probably had occasion to overhear someone complaining about the direction industrial music has taken. People who support this position often go out of their way to point out the importance of ‘80s industrial music and wistfully long for those bygone musical styles. 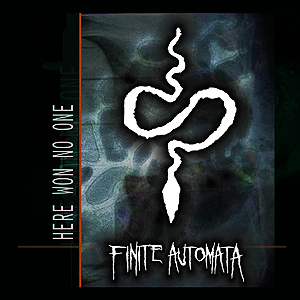 Finite Automata has heard their nostalgic cry and hearken back to the sounds of yesteryear with the debut release Here Won No One. But there is trouble ahead. Here Won No One is stained by a deep and abiding amateurism that overshadows an otherwise tantalizing prospect. The first sign that choppy waters are being entered begins as soon as you have opened your download of the EP, before you have even had a chance to press play. Despite the fact that the collection is entitled Here Won No One, the first track appears in your media player’s window as “Here One No One.” Keep in mind that while this is a rerelease of the band’s self-released EP, it is still a record label release, not a CDr you picked up at the merch table for a local opening act. 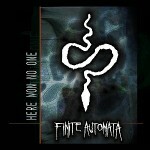 Upon some minor investigation into Finite Automata’s affiliated websites, it is clear that the intention was to title this track “Here Won No One.” Still, this mistake is needlessly confusing and shows a disappointing absence of the type of professionalism one might expect from a signed label act, even with a rerelease. Rhythm is Finite Automata lead programmer C. Grendel Sirch’s central musical concept on each track off Here Won No One. Strong programmed drums processed to fully capture the retro sound pulse through the air. Immediately, you are transported to a different time where the distorted pieces of a drum kit are reminiscent of the clockwork noise of heavy machines echoing within a vast warehouse space. The snare pounds through, the powerhouse muscle of these exhaust fume, oil smeared beats. The kick is small and round, subtle by comparison, the necessary counterpoint to the bellicose snares. Other distorted drum sounds enter the stereo field, buzzing and clicking about your perception, dragging you away from the positioning of a “real” kit and fully enforcing the concept that you have entered the realm of the mechanical and synthetic. Against this spare yet haunting structure, thin synth pads and distorted samples weave in and out, broadening the dynamic range of the songs but failing to achieve the fullness of anticipated depth. On three out of the EP’s five songs, Finite Automata front man Mod Eschar delivers above average distorted vocals. While it is apparent that some processing is present in his delivery, it seems that he has a solid intuition for what he is doing and is not relying entirely on the support of dissonant machines. His style is a blend of churning horror creep. He sounds like some subterranean child stealing goblin that sneaks into your house at night, moving things around and whispering in your ear as you sleep. It’s too bad that it’s almost impossible to hear what he his singing about. This is where Here Won No One reveals its truly hobbyist nature. The drums are poorly mixed and step heavily on the vocals, obliterating their content for even diligently focused listening. The tracks themselves become stale and repetitive quickly as beats that start out solid fail to develop and evolve. Each song clocks in at an average of six minutes and the rhythmic nature of the work quickly leads to boredom once your ear has isolated the three to four loops that are strung together. The structure of the songs themselves shows a need for musical refinement, leading the listener down unrewarding dead end paths. There is even a slight but noticeable disparity to the level at which the songs were mastered as a whole, causing the overall listening volume of the EP to lack consistency. All in all, it is a pity that Finite Automata chose to thrust themselves onto the stage at this point in their musical development. “The Shroud,” simultaneously the strongest song on the EP and without coincidence the shortest, shows that the project has definite potential. If Finite Automata continues to work on musicality and develop its sound, if the band invests in some professional mixing and mastering, then there is the promise that their next effort will deliver. Hopefully at that point, Here Won No One can simply be forgotten.